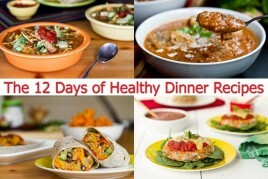 Welcome to Day 1 of the 12 Days of Healthy Dinner Recipes! I’m excited to bring back the healthy meals over the holidays. Sometimes, I have to remind myself that the time I spend preparing dinner is redeemed with quick, effortless lunches in the days ahead. It all balances out in the end. When we got back from our trip, Eric and I both found ourselves with a bit of a cold. You know the usual complaints this time of year- congestion, irritated throat, and dull headaches. It wasn’t a full blown cold, but could’ve potentially turned into one without the proper TLC. I knew I had to put away the sweets for a few days and get back to home-cooked nutritious meals. Green Monsters too! Eating out is fun and all, but there’s just something about a home cooked meal that feels amazing. This dish was just what the doctor ordered. It’s vibrant, healthy, spicy, and comforting, while still feeling a bit naughty. We can’t be nice all the time. Have you ever tried a canned enchilada sauce and loved it? This was the first enchilada sauce that I’ve ever purchased (it took me 2 grocery stores to find too) and I was so put off by the taste I almost gagged! I’m not one to gag over many foods, so I’m not really sure what it was that offended my taste buds so much. Thankfully, enchilada sauce is really easy to make and ready in about 15 minutes. Of course, if you do have a canned enchilada sauce that you enjoy, feel free to use that instead. Just use something that tastes good as it will serve as the base of the entire casserole. I made my sauce thick, but feel free to thin it out with water as necessary depending on what you want to use it for. This enchilada sauce is very “tomato-y” with a nice kick of heat (which of course, is relative, so adjust to your own tastes). I made the sauce quite thick, but you can thin it out by adding more water if you like. 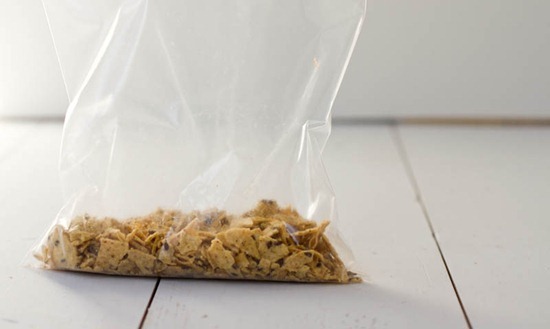 To save a bit of time, make it the night before and then store in the fridge until ready to use. 1. In a small bowl, whisk together the oil, flour, and chili powder until no clumps remain. Add this mixture into a pot over medium heat. Cook for a couple minutes. 2. In the same bowl you used previously, mix the cumin, cayenne, garlic powder, and onion powder. Whisk this into the pot mixture until no clumps remain and then whisk in the tomato paste and water. Whisk until smooth. 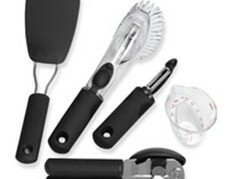 Whisk, whisk, whisk…because I haven’t said whisk enough apparently. 3. Simmer sauce on low-medium heat for about 10-15 minutes. Checking it every 5 mins and whisking. Add salt to taste and adjust seasonings if desired. While the pasta is cooking, chop and sauté your vegetables and cook for about 5-10 mins. Now add half of the enchilada sauce (about 1 cup), taco seasoning, and drained & rinsed beans. 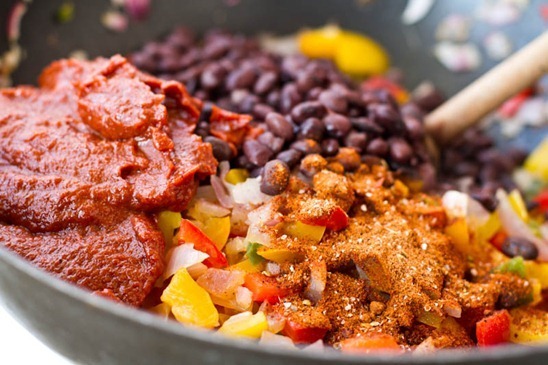 The spicier you like it, the more taco seasoning you can add. I used a couple tablespoons of my homemade taco seasoning and it was quite spicy. Stir it all up and taste test. After cooking for 5 mins more, add in the chopped green onion and Daiya cheese. Spread 1/2 cup of enchilada sauce over the bottom of the dish. Stir in the cooked pasta really well and place into a 2 quart casserole dish. I recommend sprinkling on the crushed chips just before serving if you plan on having leftovers. The chips will get a bit soft while in the fridge so it’s best to put them on right before serving. Bake for about 15-20 mins at 350F until heated through. Sprinkle on chips. Top with avocado, salsa, sour cream….whatever tickles your fancy! Serve with a big green salad and tortilla chips. Pretend you are on a beach in Mexico. Eric summed it up quite well when he said, “If a restaurant near my work served something like this, I would eat it everyday.” I love that man. 1. Preheat oven to 350F and grab a 2-quart casserole dish. Add dry pasta to a pot of boiling water and cook for 7-8 minutes. Be careful not to overcook the pasta or it will get mushy in the casserole. Drain and rinse with cold water to stop the cooking process. 2. 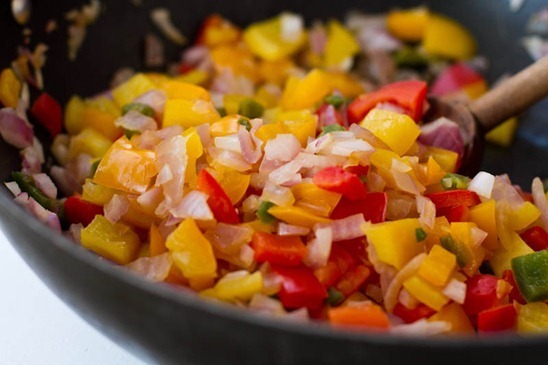 In a large skillet, sauté the chopped onion, jalapeno, and peppers in the olive oil over medium heat for about 7-8 mins. 3. Add the taco seasoning, drained and rinsed black beans, and 1 cup of the enchilada sauce. Stir well and cook for another 5 mins. 4. Stir in the cheese, pasta, and chopped green onion. 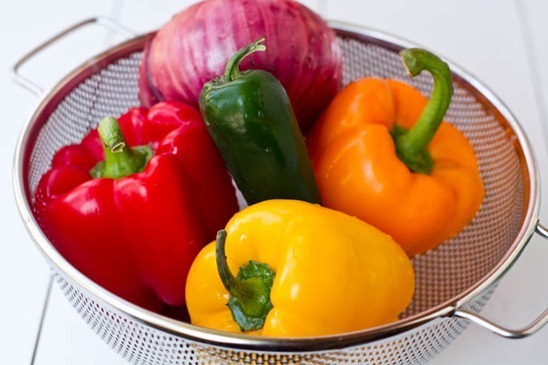 Season with salt and pepper to taste and adjust seasonings if necessary. 5. Spread 1/2 cup of enchilada sauce over the bottom of the casserole dish. Scoop on the skillet mixture and spread out evenly. Spoon on the rest of the sauce on top and sprinkle with cheese. 6. Bake for 15-20 mins at 350F until heated through. Sprinkle with crushed nacho chips, chopped avocado, salsa, and sour cream if desired just before serving. Serve with a big green salad and nacho chips. Note 1: Be sure not to handle the jalapeno seeds as they can make your fingers (and anything you touch) sting badly. You can also wear plastic gloves too. 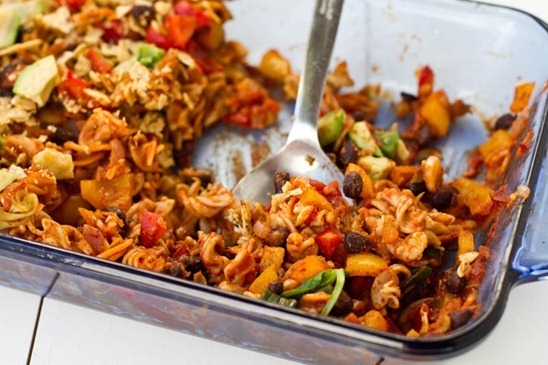 Note: Want a burrito filling and not a casserole? Try subbing the pasta for brown rice. 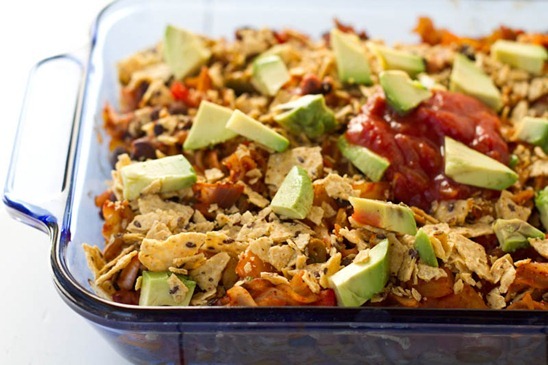 What I love about this casserole is how versatile it is! Add more Daiya cheese (maybe another 1/2 cup), leave out the pasta, and use the mixture as a hot dip for nacho chips!!! It could potentially make quite the party dip with a few changes. this looks fabulous I love the idea of a casserole perfect for reheating & this time of year!!! This looks amazing and like something I could eat everyday! I love tex mex type stuff like this. I love that you used tomato paste instead of tomato sauce to make the enchilada sauce! yum!!! i made something simalar a few weeks ago!! sooo good! mexican food drives me wild! it’s amazing in every way! This looks lovely and perfect for this time of year too. Enchiladas make an awesome burrito filler – I had one last week and I thought I wouldn’t like it but it was really awesome. I really like the idea of using pasta. Clever, girl! The recipes I have tried use tortillas which can get mushy. Yuck. MMMMMMM…this seriously sounds SO good right now! i’ve never had pasta in mexican dishes, but it looks delicious! This looks delicious and colorful. Can’t wait to make this myself! I am Mexican-Canadian, and I can tell you your casserole is the real deal. 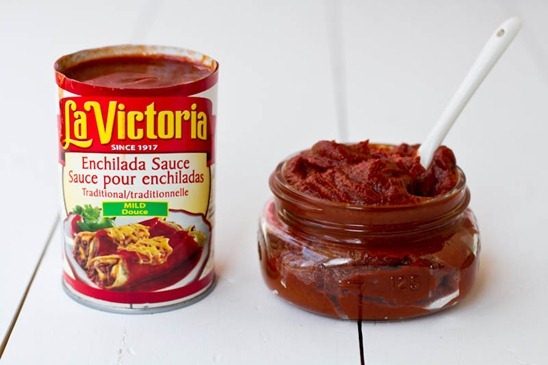 Regarding the “La Victoria” enchilada sauces, I can tell you that I do not like the red sauce. The green tomatillo one is much better. If you like tomatillo, I highly recommend that you get the green “Herdez” salsa. It’s made in Mexico, and it is much more authentic than La Victoria. You can usually find it in Loblaws/Superstore. That being said, making your own salsa is also not hard as you say, and you can be sure of the ingredients you put in it! Hey Georgina, Thanks for your comment! That is good to know about Herdez brand, I will keep my eyes peeled next time I’m at the store. I love the idea of layering corn tortillas in this dish….it could really be changed up so many ways! 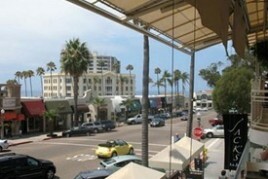 I agree with Georgina – after living in LA for 10 + years, Herdez is my Mex go to…there stuff is yummy! Angela – I’m making this one on Saturday – your so talented!!! love it! It is unfair how delicious this looks! I agree with Hannah and that the enchiladas would make an awesome burrito filler. We always have tortillas at home so I may give it a go! I’ve had ENCHILADA on the brain. Thanks for reading my mind! Thank you for spending the time creating the 12 days of healthy dinners! That is so helpful this time of year. Plus, your recipes are so satisfying and good, it gets rid of any temptation to eat the mass of unhealthy foods around now :-) As soon as I get to the store to pick up a few things, I am making this pronto! Thanks again! This sounds like a great dish to make on Sunday for quick lunches/dinners during the week. Love the photos this morning Ange! I’d totally use this as burrito filling or on top of a big salad. Sounds like you and I are craving the same type of cuisine this week – I just posted a tortilla soup and lately, the spicier the better! I hope you and Eric can kick your colds soon! Love a good spicy, tomatoey sauce and I love how easy this looks! Casseroles before the craziness of the hols are much appreciated! Mmmmm this looks fantastic! Thanks for sharing! PERFECT timing! I was looking for some recipe ideas that could be easily put together in the evening for a packed lunch. Mmm!!! Perhaps I shall make this on the weekend! Yes indeedy! heh…well those looks amazing all in their own right! Veggies are easier to photograph though, I always forget that. I had fun today with my salad photoshoot. The bright veggies do most of the work for me. Where do you get Daiya cheese? Holy yum! My husband just grabbed a bag of sweet potato tortilla chips from TJ’s last week as a total impulse buy and they are quite possibly the best chip I’ve ever bitten into. I’m now dreaming of this with those crushed on top! Bookmarked in my new year recipe folder. I love those chips too so any reason to buy those is good with me! I love this idea! My mom used to make something similar and I totally forgot about it until now. It must be the winter weather, but I cannot get enough black beans lately. I’ve never liked enchiladas but I’m curious to try them (or this recipe!) with homemade enchilada sauce–maybe it was the canned enchilada sauce I didn’t like! 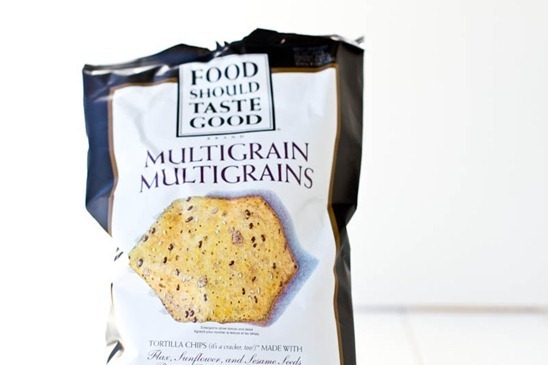 Great choice for chip topping, love those so much! 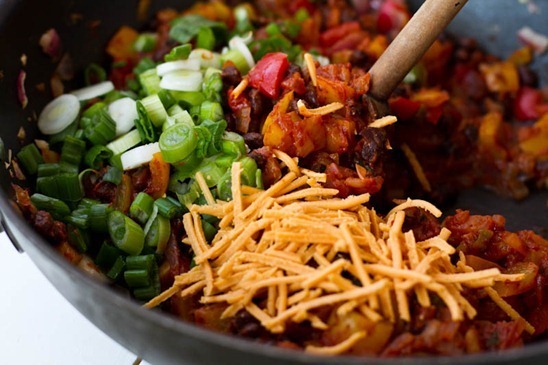 and this casserole looks so comforting and filling mmmm! This looks so good- I can’t wait to make it!! How could you have possibly known I was looking frr the perfect enchilada recipe? Thank you for always cranking out AMAZING stuff. But how do you get enchiladas to photograph so well? They don’t want to look good for me. enchiladas are really hard to photograph!! I always struggle with mine…I find shooting top down works best because it gives a nice overhead view. Wow this sounds amazing, I love the veggie, spicy, cheese combo! I wonder if it would work with a nooch cheese sauce instead of Daiya cheese, I’ll have to try it and let you know. Yes please do…I think a homemade vegan cheeze sauce would be amazing! Oh my. I wish I could be eating that for lunch right now!! Looks absolutely amazing! Comforting and filling but super healthy. Bookmarked. 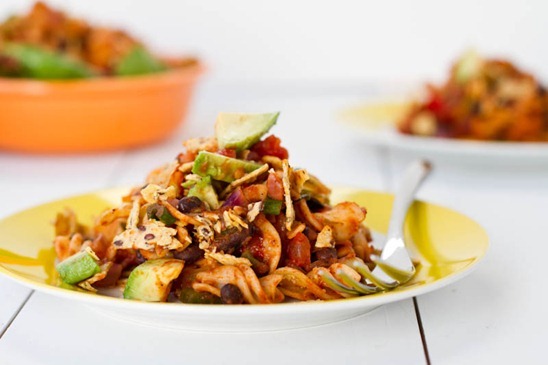 Oh this recipe looks delicious, I am always looking for healthy takes on Mexican food! Pinning this recipe! Wow, this looks wonderful! I am excited to try making it, especially because I am back in the US visiting my family so I can get the Daiya cheese! In Canada, is it still legal to have BPA in can liners like it is here? I’m curious. I’m not sure Cat, I will have to look into that. Your recipes are soo cool! I just made your Maple Almond Butter last night and it’s amazingly delicious! I think I could eat it all at once! Might have to try these Enchiladas too! Looks delicious! I can’t wait to try. It looks so colorful- and I have had canned enchilada sauce and thought it was all right, but homemade probably rocks! Homemade Mexicn food is so much tastier than ordered stuff. So smart!! 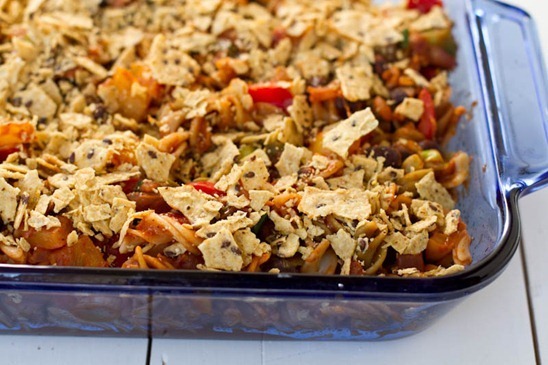 This totally gives me endless options – We love fajitas – so this would be awesome to make fajita casserole!! Yum!! This looks delicious! I’ve been looking for a great enchilada sauce recipe – I’ll give this one a try soon! No I havent but I’ll keep my eyes peeled! This looks so good! It’s so easy to forgo eating healthier this time of year. Having leftovers the next day is the best. I haven’t found a canned enchilada sauce that I like yet, but haven’t gone to the trouble to make my own. I think this needs to happen! I got a frantic email from my boyfriend linking back to this recipe. I think someone’s hooked on your recipes Ange, and it’s not me I’m talking about ;) I’ll be making this asap, it looks delicious! Omg. You did NOT just put chips on top of that casserole. I think you may be my hero. lol…it honestly made the casserole! Who knew? This looks amazing! And I love the idea to swap brown rice in for the pasta. Just gotta make sure I buy a gluten-free enchilada sauce (or make yours gluten-free). Looks like a winner! I’ve been looking for an enchilada sauce for SUCH a long time. 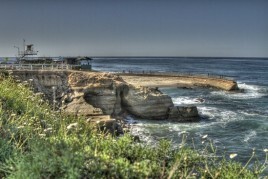 Your photos from your trip look great, especially those HDR shots. keep the holiday recipes coming! I love meals like this so much. I know what you mean about enchilada sauce though so I am so glad you have a recipe. I can’t wait to try this just as it is, but there are so many variations! Awesome! My god, Angela you have outdone yourself!! Can’t wait to see what you have up your sleeve next!! hah yea I figured it was not authentic by any means, but fun none the less. I will have to try the dried chilies soon. Thank you for this delicious recipe. I will be making it tonight!! I can’t wait for others! Love your Blog! THank you so much for sharing your life’s journey and your beautiful recipes! Can’t wait to try this one! OMG, I just made a veggie tomato sauce inspired by your recipe and it tastes amazing!!! This is one of those meals I think you could make at least once a week and never get sick of it. Well done! Naughy ot Nice…I love it! What a fresh take on an old favourite! Yum! I love the ‘throw it all in the dish and hope for the best’ casseroles. Layers and such intimidate me… and they take forever. Great recipe, Angela! That looks so good! I love how bright and colorful it is! Angela, thank you so much for an enchilada sauce recipe, I haven’t been able to find a canned version that I like yet, but I do love tomato paste and cumin so I can’t wait to make it… plus the whole meal looks great! Yumm that looks like the perfect winter dish! I love foods like this, And it seems fun to make too! What a great spin on enchiladas! Can’t wait to try this one. Thank YOU! This sounds amazing, I can’t wait to try it! Mmmmm, that looks wonderful. And I love that brand of chips! Oh this looks yummy – quick and easy as well! I will be making this next week! This looks so delicious. I was going to make tacos tomorrow, I think you changed my mind. I love the idea of making this with pasta rather than going through the work of making a tray of enchiladas. Quick, easy, and healthy – my kind of dinner! Angela I made this tonight for dinner – and altered little bits to suit the whole family. Gluten free pasta for everyone, and then real cheese for the family members who still eat cheese, cheeze for myself, and extra flavour in one section for my husband and I as the kids cant’ handle too much! Fantastic recipe – everyone loved it! Hey Ali, that’s great to hear! I love how adaptable it is too. Thanks Angela! I made this tonight and it was AWESOME! Can’t wait for the next eleven days! I love mexican food and this looks great! I have always bought enchilada sauce in cans but now that they are saying BPA is in canned foods, I need to make my own! Ohh, I love dishes like this that you can throw together then put in the oven. Thanks for sharing! Recipe looks AMAZING! Another way to change it up would be to leave out the pasta and bake it with corn bread batter placed on top in small “blobs”. I make Mexican casseroles with corn bread all the time – so good! This looks delicious! I need to make time to make this in the next week. Oh Angela! This enchilada looks out of this world! What a nice easy dish to make! I just love Mexican!! If I take a taste of any canned enchilada sauce I’ve purchased, it has tasted horrible. But, it always seems to taste good when combined with other ingredients and baked. But, really- I should try making my own- especially since you make it sound so easy! Made this yesterday and I think it’s even better the second day! Yum! OMG! This looks so good! I’m definitely trying this one! I’ve made several of your recipes and they have all been delicious! So, when are you coming out with a cookbook, cuz I’m definitely buying!! Made this last night with the homemade enchilada sauce and it was delicious! I saw the question regarding BPA in canned foods in Canada. The latest info is on www.Chemicalsubstanceschimiques.gc.ca. Click on the highlights link for BPA and then the risk management action milestones…looks like canned foods are still ” in development”. I try and buy Eden Organics brand which is certified BPA free. I do not believe anyone has discovered how to can tomatoes without a plastic lining to date…I try to buy tomatoes in glass. As for the beans I make up a large batch and freeze it in canned size portions…much cheaper! Thank you Nancy! Great info. I too like to buy the Eden products. I just made this tonight!! I threw in about 1/2 can of Hermez chipotle peppers instead of taco seasoning…. Rave reviews from both of us over here! I made a similar black bean enchilada casserole last week. I used corn tortillas instead of noodles and I thought that the dish turned out pretty yummy. I’ll have to try yours. This looks delicious. I think I will make it for some friends who recently had a baby. To put my own twist on it, I think ill sub the pasta with corn and rather than cornchips on top, I think I will bake a cornbread mix on top. I’ve done it for other casserole recipes and it works great. Have a good weekend and thanks for writing such a wonderful blog. I just made this and thought you would want to know, that the printable recipe doesnt say when to add the pasta. So I mixed it with the veggies.. I made this for dinner tonight and it was pure comfort food. I made an attempt at making vegan sour cream to serve with it and I thought it came out pretty good. Thanks for another great recipe!! My husband and I are both looking forward to leftovers. Just made this tonight. SO good! Even my husband who thinks dinner is a failure if meat isn’t involved, loved it! The only mistake I made was that I used the entire packet of ‘Simply Organic Spicy Taco Seasoning’….not the 1 – 3 Tbsp called for. Very spicy but still so, so good! This one is a keeper for sure! I just made this for dinner tonight. I used 1 tbsp of the homemade taco seasoning, and it was still too spicy for me! I think I am too sensitive to spicy foods! It was really good and filling, though! Next time I will have to use less of the spices! the colors of the enchilada are so vibrant! I think I’m just going to be planning + making my own Christmas + birthday foods! Hi Angela, my boyfriend and I made this for dinner last night and the whole time I was singing “Angelaaa, I love you!” This was absolutely delicious and I can’t wait to eat it again for lunch! We are Americans living on the Franco/Swiss border right now and Mexican food is incredibly hard to come by, but if we find some it’s not good! This is such a fantastic and easy dish! Thank you for posting it! Plus, all your food makes me very happy in a land of non-veg-friendly food! I made this recipe yesterday and it was oh so good! My husband loved it, too! We will definitely be making it again. Thanks! We just made this (and subbed rice for pasta) and it’s AMAZING! Seriously delicious, and also so good for us. Thank you!! I just made this recipe for my husband and myself. It was amazing. I had to modify it just a bit because I forgot a few items while shopping- but it was still amazing! Thanks so much!!!! Thanks Jenn! Im happy you both enjoyed the casserole! I’ve tried that enchilada sauce and it almost made me gag too, I love mexican food! What is your favorite vegan cheese brand and is it close to reg cheese taste( honestly)? my fav is Daiya cheese…even Eric likes it! These look amazing! I can’t wait to try them. I like to link and re-post recipe’s on my site. This is definitely going to get a shout out! Thanks for creating amazing goodness and sharing your talent. I made this last night with rice instead of pasta to keep it gluten-free and loved it. My three sons (10, 5 and 5) loved it too. Thanks! i have made this twice since you posted it, with brown rice. i am in looovovvvvvveeeeee with it! i just eat it how it is, without chips, so its all nice, no naughty! well…i did make it for a work potluck today so i ate some whole wheat chips with it. it was a hit !!! so yummy. whohoo :) Thats great to hear! Made this tonight and it was delicious! I made the enchilada sauce and taco seasoning as you suggested, as well. I did leave the jalapeño out because I had little ones eating it, but it was still had enough flavor to be very tasty! YUM! I just made this substituting fresh salsa for the enchilada sauce. SO good! Since the salsa was fresh it was much more watery than enchilada sauce so I let the mixture cook in the saucepan for a few extra minutes to allow for some evaporation. I will be making this over and over again I’m sure! I made this last night for dinner and it was AWESOME, seriously! It’s now going to be a staple in our house. Cant wait for the other 12 Days of Healthy Dinner Recipes! So colorful and bright! Such a lovely recipe! I finally got around to making this recipe and knew I was going to like it but WOW… I loved it. I completely forgot that I had already used my peppers up earlier this week when I started cooking this so I ended up substituting in spinach and mushrooms and it was still fantastic. Can’t wait to make it again with the peppers. Thanks for your wonderful blog and recipes. Made this tonight with just a couple modifications (added chicken and regular cheese) but it was divine. The flavors were excellent and that enchilada sauce was amazing. I made this for supper and it was incredible – the perfect amount of heat! I actually divided it between 2 smaller casserole dishes and plan to freeze the second one – we’ll see how that works out. Nevermind Angela, I made this tonight and it turned out amazing!!! Sooo looking foward to the leftovers :) Thanks for the awesome recipe! Awesome recipe!! I almost forgot to mix the pasta in though as I think you forgot that step in your directions!! Just pulled it out of the oven and about to enjoy! Thanks! thanks for letting me know, I just updated it! I’m so sorry if these are really dumb questions, but I’m eager to make this and want to make sure I get it right… If I’m subbing rice for pasta, do I still just use the same amount of uncooked rice as I would pasta (8oz)? Does it need to be quick-cooking pasta? Will using rice alter the baking time? Thanks so much! The pasta is cooked before baking the casserole. I didnt use quick cook, just regular. If using rice instead of pasta, I would probably use 1 cup dry rice (should yield about 2 cups cooked, maybe?). Rice is much more dense, so I wouldnt use much more than that as you dont want a dry casserole. I hope it turns out for you. You can also read the comments as someone may have already tried rice. Goodluck with everything! I made this tonight because I had a bunch of bell peppers hanging around and your beautiful pictures made me drool. Oh my gosh! I am stuffed, having eaten way more than I should have. I’m already dreaming of leftovers. I’m happy you enjoy it Carmie! Is it really 16 total ounces of tomato paste? The cans I found are either 6 or 12 ounces. This was amazing!!! Thank You!! Hi! I just wanted to say I absolutely LOVE your website! It is so inspirational! I just so happened to run across it while at work, and can’t wait to try so many different recipes! 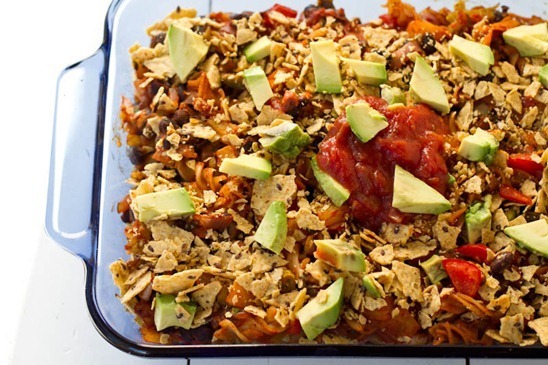 I tried this enchilada casserole last night and it turned out GREAT!! Thank you for all your hard work and amazing, healthy recipes! Made this tonight, so tasty, everyone had seconds!!! I added some soy cream cheese to the sauce and whisked it through, which made it nice and creamy too…..a wonderful meal with a salad. Love your photos that inspired me to make it!! Thumbs up from my family of 7!!! Just made this tonight for dinner. FABULOUS. For our plates, I had four avocado slices on the bottom and put a cup of the casserole on top of it, with a tbsp of sour cream on top. Hubby loved it, and there’s a ton left for tomorrow! Thank you, angela!! Another great recipe for my weekly lineup! PS! I found Frontera enchilada sauce at our whole foods so I wouldn’t have to make the sauce….and it was GREAT. Trader Joes makes a pretty good enchilada sauce. I also added zucchini to get moe veggies in the recipe. It was yummy! My husband made this last night and it was fabulous!!! Thank you so much for your amazing recipes! I made this and it was delicious! My 13 year old son, very much a meat eater, loved it too! This is an awesome recipe! So simple, too – it seems like a meal you could whip up fairly quickly and easily. I wish my family liked spicy foods, black beans, and peppers. It’s way too much to make all for myself :( Maybe I’ll find something to make it for sometime, it’s really too good to pass up! Made this tonight – soooo good! It’s hard to nail down my favourite recipe of yours, but this may be it! i made this tonight! It was delicious and my kids loved it as well..
Do you think I could put all the ingridents minus the garnishes in a slow cooker and cook it that way? I want to make this tomorrow but am thinking it may be easy to throw together in the crock pot in the morning. Thanks! I think my reply is now too late, Im curious what you ended up doing? Well, I overslept Friday morning so ended up not having time to prep it. :) I still want to try it out though. I made it the regular way that night and even fooled my meat eating Dad. He really liked it! This is delicious but I wished I was was warned of the hazards of jalapeño peppers. I am a novice vegan and had not cooked with jalapeño peppers before. I did not ware gloves and touched my face and now my hands and face and stinging so badly I may go to the ER. I googled what to do and nothing works. Please warn people of this with any recipes that call for jalapeños so they can avoid this misery. Oh Susan Im so sorry to hear about this! I will be sure to add it into the recipe. I made this tonight and it was fantastic. Manfriend said it was his favorite meal that I’ve made for him. Kudos on a delish recipe! This was sooooo delicious. I think I’ve found my new go-to Mexican fix! I made this tonight for myself and my carnivorous hubby (he got some extra cheese to make up for the lack of meat) and we both LOVE it. It was a tad spicy, but I’m not sure if it was the jalapeno or the taco mix (I made my own), but I fought through the pain and it was totally worth it. I added some pico de gallo and guacamole on top and I didn’t even miss my usual sour cream. Tomorrow I’m going to make tortilla wraps out of the leftovers. Mmm-mmm!! I just made this for dinner- it was delicious! Definitely spicy! My employees are mostly Egyptian, and they do regular fasts (periods of being vegans). Every month, I throw a party for birthday celebrations, and this month they happen to be fasting on the day of the party. So, I decided to make this for them! The party is today and I hope they love it! Thanks for the great idea! Thanks so much for this DELICIOUS recipe!! I made this yesterday, and we LOVED it!! My husband couldn’t stop raving about it. He said we need to put it “in the rotation.” :) This is a keeper, for sure!! Found this recipe on Pinterest and made it tonight. It was DELICIOUS! Even my very non-vegan 16-yo proclaimed it to be a winner! I will definitely make this again! Thanks so much!!! We omitted the non-dairy cheese just because I have still not found one that I am fond of, and omitted the sour cream. I was so excited to eat it last night that I completely forgot avocado (my favorite!) and the salsa. I did remember today-wonderful!! When is your book coming out?! I can’t wait to buy it!!! I am still getting requests to make your wonderful chocolate cupcakes-from vegans and non-vegans alike! Angela, this was so good! Your recipes are fantastic because even the meat-eaters in my family are eating them up and going back for seconds. Hi Pam, so glad to hear that! Just made these and have to say they were excellent! Added pico on top and had a watermelon smoothie with it. I made this tonight and it was great! I used brown rice pasta and left out the Daiya cheese. I also crumbled Neal’s Brothers Organic Blue with Flax Extremely Tasty Tortilla chips (the best tortilla chips out there) on top along with avocado. It was fabulous! I will be looking forward to lunch tomorrow. Thanks. Making this for dinner tonight. Except I only have one bell pepper and loads of squash, so I’ll use those in place of two peppers. Also, I’ll be adding corn because its summer and I have lots of it. Thanks for the recipes! Keep em coming. I just made this last night, subbing 2 cups cooked brown rice for the noodles, and using the Rick Bayless Red enchilada sauce from whole foods. IT WAS SO GOOD! Thanks for all your great recipes. This was delicious! We make it often and we threw in corn and diced tomatoes. It makes it hearty! Made this twice this week–one to try it out and once for a block party. Was a hit with my family and then my neighbors–as ALL your recipes are!!! Thanks!!! This looks yummy. I need to lay off tomatos so I was wondering if you had any suggestions on a tomato paste substitute that is still vegan? Anybody have an idea of the calories for this casserole? I made this a couple of weeks ago, and it was FABULOUS. One of my favourite recipes and fool-proof for people who aren’t used to cooking a lot because it’s in one casserole :) But I like spice so I added about 10 times the amount of chili powder, makes my breath almost flammable. Made this for the first time tonight with enchiladas verdes sauce (b/c I prefer it) and also a first trying daiya cheese and non-dairy sour cream. For chips, I used TJ’s sweet potato chips. It was delicious! And my husband loved it too! Was concerned it might be a bit spicy for the kiddos so I did a separate dish for them without the jalapeno and enchilada sauce but I wouldn’t do that again as it turned out not to be necessary – it wasn’t too spicy after all (perhaps because I only used 1 rounded tbsp of taco seasoning). Raved to my husband about finding your blog and now want to pre-order your cookbook! Made this for dinner tonight – I used brown rice instead of pasta and added chicken. It was amazing AND a huge hit with the family! Thanks for the great recipe. Don’t know how I hadn’t seen this recipe before now! Bookmarked this a few days ago and then found myself with a sneaky cold-like feeling yesterday. This was absolutely perfect. Helped clear out my sinuses and now I’ve got yummy lunch for days! This is a keeper! Thanks for a great recipe! Loved everything about it and will definitely make it again. I think I might add a can of corn at the same time as the beans, just cause I love corn! Trying this one but will probably have to use real cheese. I try to cut dairy as much as possible but the fake cheese has so many suspicious ingredients in it and GMOs that I prefer going w/grass fed. Took this to a pot luck. Everyone loved it! Hello, I’m mexican and I’m pretty open minded in regards to the variations of mexican dishes made by people in other parts of the world, but this recipe is nothing like an enchilada, no mexican would call it that. This is a pasta dish with vegetables and salsa, oh! and tortilla chips. The fact that you used a can of salsa, avocado and tortillas donesn’t make it an enchilada. I’m not sure if this dish is your creation, if it is, be carefull, you can confuse people. Did you know that the UNESCO declared Mexican Cuisine Intangible Cultural Heritage of Humanity?? Other than that, I love your blog. I made this recipe for my family last night and they loved it! I can’t have gluten (made some substitutions) and I’m a vegan, so my family and I struggle to find food that we can all agree on. As a side note I wanted to really send a heart felt thank you for your website. I’m currently living with my twin brother and my father in a completely different city than my husband, because my mom is very ill, and just recently suffered a stroke. Although this may sound silly, to be able to find a recipe that – in the midst of this chaos, was able to bring us all together, if only for a moment, is something I am so grateful for. Hi Bonnie, Thank you for your kind words. My heart and thoughts go out to you and your family! I want to make the Vegan Enchilada Casserole but I want to freeze it afterwards for a party in two weeks. Do you think it will freeze ok? Did you have luck freezing? Thanks! I made this to bring as my lunch this week and it is absolutely delicious! Great job and thank you for sharing. I look forward to trying more of your creations in the future. This was delicious! I used gluten-free brown rice pasta instead of what the recipe said. I also used the enchilada sauce recipe and the taco mix recipe. The entire thing was a big hit! Thank you! Just made this last night and it’s soooo good! the flavors are so wonderful and making the enchilada sauce and taco seasoning I think really aided in that. Awesome recipe that I’ll definitely make again! This was delicious! Don’t skip the sour cream, it really elevated the taste. I am looking for a recipe that I can make, then freeze for someone to reheat a little later. Will that work for this recipe? Where do I get vegan sour cream? I love this recipe! I added corn, black olives, and topped it with a vegan cheese sauce. 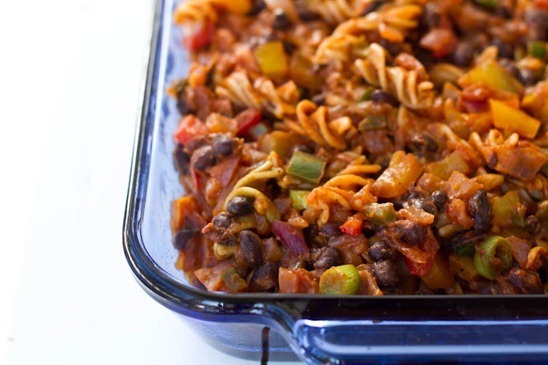 It almost tastes like a healthy chili mac recipe. 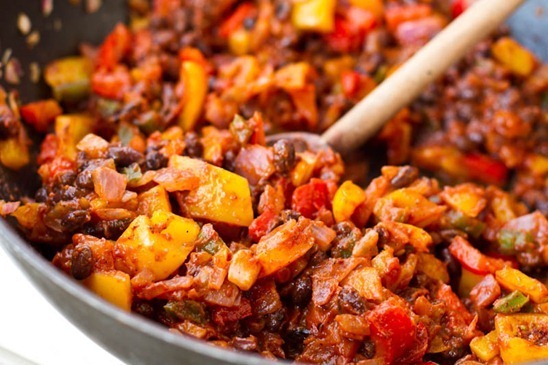 Love this – a little spicy for some family members but that is easy to tone down. I have eaten it 3 days in a row and stil loving it! Your website rocks!!! Love this. Angela you’re brilliant. Just made this for dinner. And posted it on my blog. Did I mention I love just about every single on of your recipes? I made this recipe last night and it was delicious. I took your recommendation for substituting the rice for the pasta in order to make burritos. I took it an extra step by assembling a burrito with avocado, cheese, and the filling and then using a panini press to make it a grilled burrito. This was really good. Our 13 year old (maybe vegetarian) loved it. I think it was a little bit too much on the tomato paste. Next time I will likely reduce to about 2/3 and add some broth. But very good. I like the idea of the brown rice to make a burrito filling. Even the veggies/beans alone could be put on top of spinach for a salad. Has anyone tried this with gluten free pasta? I took this to a gathering Sunday afternoon. It was my first time making it and I used a vegan cheese recipe made with potatoes and carrots. It was a huge hit! One person told me at least three times how much he enjoyed it!!! I always have succes with your recipes!! Thank you SO MUCH for this blog. One day I hope to get a copy of your cookbook. Okay so I just want to leave this comment here for anyone who is considering making this recipe: IT IS THE BEST THING EVER. Literally the perfect recipe and my favorite food. I have made this recipe more than 30 times already over the last 2 or so years since I found it. It is absolutely incredible. And anytime I make any type of enchilada anything I use the enchilada sauce from this recipe. I love almost all the recipes on this blog but this by far is my favorite. Thank you Angela for creating this beautiful food. Really, thank you from the bottom of my heart!! I’m making this recipe for some friends but they will be freezing it. Any suggestions as to the best way to freeze this dish? Hi Kristina, If your friends will be freezing the dish, I’d recommend sprinkling the crushed chips on individual portions only, just before serving each time (rather than sprinkling them all over the whole thing at once). That way the chips will always be at their perfect crunchiest, rather than risking getting soft in the fridge, burnt during reheating, etc. To freeze the casserole, simply place it into an airtight freezer-safe container of choice, leaving an inch or so of space at the top to allow for any expansion; for individual servings, feel free to split the casserole up into smaller containers. As well, depending on how long I plan to store a certain dish in the freezer, I sometimes place a piece of plastic wrap on top of the food because I find it helps prevent freezer burn. I hope this helps, and that your friends enjoy the meal! What a great recipe, so so creative! Oh I’ve been there before! It’s a fine line, isn’t it? You may be able to dilute the flavours with a bit of tomato sauce? I’ve made this several times and really like it. Have you tried making and freezing ahead of time…either cooked or not…and does it turn out ok? Hey Linda, I think you can freeze it unbaked…I would leave off the tortilla chips and add them just before baking. I would also thaw it overnight in the fridge (or on the counter) before baking. Hope this helps! Thanks so much Angela. I’m making it right now and will freeze it..my family including 2 vegans and one vegetarian and a couple of semi- vegetarians will have this several days from now! Sounds like a great plan!! I hope you all enjoy it. I have made this twice and like the recipe: easy and tasty. I did make one change this last time. Some Latinos in a kitchen near me make an avocado sauce that I thought might be a good addition and my family did like it (I have a photo but don’t see a way to upload it). blend and serve on side. It is easy and tasty. I made this for for a Christmas party and it was a hit. It is absolutely delicious. Everyone loved it and went for seconds. The next day the casserole tastes even better because the flavor fuses over night. I could not find enchilada sauce , so I followed your recipe to the dot. It came out wonderful, full of flavor very comforting and I felt like I was in Mexico eating this meal. Thank you so much !